Less than a day after he scored the dagger goal to secure FC Barcelona a spot in the UEFA Champions League final, Brazilian football star Neymar Jr. officially joined Team PokerStars as the room's latest brand ambassador. "Growing up and playing football everyday has made me a competitive person," Neymar Jr. said. "When I'm not playing football, playing poker and competing against my teammates on the road or in home games with friends is one of my favorite things to do." According to the world-famous striker and Brazilian national football team star, his entrance into the poker world has been a natural step, as he believes that the two games have more in common than many may think. "To be a successful poker player, you require many of the same skills needed to be a successful footballer — mental strength is important; resilience, patience, composure, and focus," he said. "I love the challenge, whether it's on the football pitch or at the poker table." The first Brazilian sportsman to ever be featured on the cover of TIME magazine, the 1992-born player was named by SportsPro Magazine as "the most marketable athlete on the planet" for two consecutive years. In 2014, Forbes placed Neymar Jr. fourth on the list of the world's highest paid football players, with earnings of $28 million. According to David Baazov, CEO of PokerStars' parent company Amaya, Neymar's signing represents an investment in the growth of poker at a global level. "Neymar Jr. is a young and extremely charismatic megastar who loves interacting with fans on social media, is comfortable on camera, and loves the game of poker," Baazov said. "And as a superstar with one of the world's most famous football clubs and football nations, his appeal is global. This partnership is a great opportunity to market the game of poker across the globe and attract new fans." A similar enthusiasm about the deal came also from PokerStars' interim CEO, Michael Hazel, who explained, "Neymar Jr. is one of the brightest stars in the sporting world, and PokerStars is proud to be associated with him. Together we will grow the popularity of poker and show new audiences the competitive, fun, and strategic game of poker. Working with Neymar Jr. continues PokerStars' history of investing in mainstream athletes who want to leverage their success in competitive sports to become successful poker players." In love with the game of poker so much that he even named his own dog "Poker," Neymar Jr. will now represent the PokerStars brand all over the globe and provide the world's biggest poker site with a formidable access to the 18 million-plus Twitter followers and 51 million-plus Facebook fans who follow him every day. At Poker Stars, Neymar Jr. finds a team composed by even more world-famous sports stars such as another legend of Brazilian football Ronaldo, 14-time Grand Slam tennis champion Rafa Nadal, and Holland's Beijing Olympic gold-winning field hockey captain Fatima Moreira de Melo. Neymar's debut in the live poker circuit is set to take place during the first leg of the European Poker Tour in Season 12, when the PokerStars-branded live tournament series will hit Casino Barcelona in Barcelona, Spain. During the festival, Nejmar Jr. will engage in a series of "Celebrity Duels," where poker players and football fans will be given the chance to meet Neymar Jr. and to play against him in these special poker games. 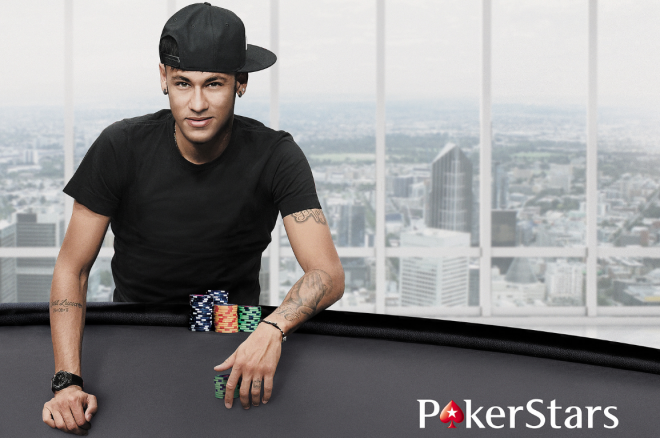 Additionally, Neymar Jr. will play online poker on PokerStars under the user ID "neymar-jr".